Combine egg, ricotta, spinach, mushrooms and zucchini in a large bowl. Combine crushed and diced tomatoes and their juice, garlic, Italian seasoning, onion powder, salt, and crushed red pepper (if using) in a medium bowl. Generously coat a 6-quart or larger slow cooker with cooking spray. Spread 1½ cups of the tomato mixture in the slow cooker. Arrange noodles over the sauce, overlapping them slightly and breaking into pieces to cover as much of the sauce as possible. Spread half of the ricotta-vegetable mixture over the noodles and firmly pat down, then spoon on 1½ cups sauce and sprinkle with 1/2 cup mozzarella. Set aside the remaining 1/2 cup mozzarella in the refrigerator. Put the lid on the slow cooker and cook on High for 3 hours or on Low for 5 hours. Turn off the slow cooker, sprinkle the reserved ½ cup of mozzarella on the lasagna, cover and let stand for 10 minutes to melt the cheese. The dark gills found on the underside of a portobello mushroom cap are fine to eat but can turn your food a gray color. To remove, gently scrape the gills off with a spoon. If whole grain lasagna noodles are not available, you may substitute regular lasagna noodles. This dish is perfect for leftover veggies or simply swap out the spinach, mushrooms, and zucchini for your family’s favorites! Try bell peppers, yellow squash, eggplant or broccoli. 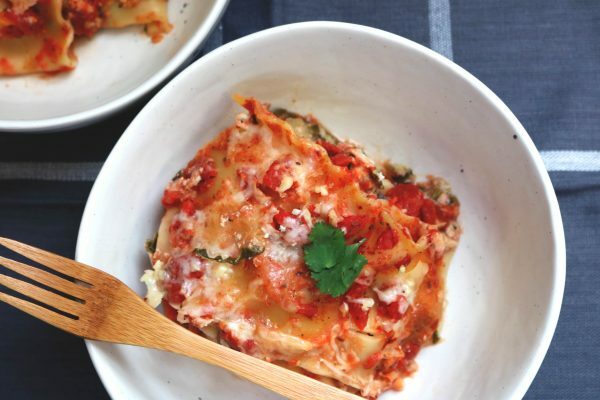 With just one container of ricotta cheese and 1 1/2 cups of shredded mozzarella, this recipe is lower in saturated fat and sodium (hello, heart health!) than other recipes but still has just as much flavor! 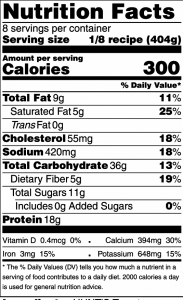 Nonfat cottage cheese can be substituted for the ricotta cheese and may offer cost savings.